Objective: In a secondary data analysis, this pilot study evaluated the relationship between subgingival biofilm morphotypes and chronic periodontitis progression in treated adults. Methods: Periodontal parameters in 47 adults with chronic periodontitis were assessed by a calibrated examiner at baseline and a mean 4.5 years after a non-surgical periodontal therapy regimen. Microbial and inflammatory cell morphotypes in subgingival biofilm specimens from each patient were evaluated with phase-contrast microscopy at baseline, and at post-treatment intervals. Chronic periodontitis progression in patients was defined as ≥ 2 teeth exhibiting ≥ 3 mm interproximal clinical periodontal attachment loss from baseline evaluations. Bivariate and odds ratio analysis assessed baseline and post-treatment variables relative to chronic periodontitis progression. 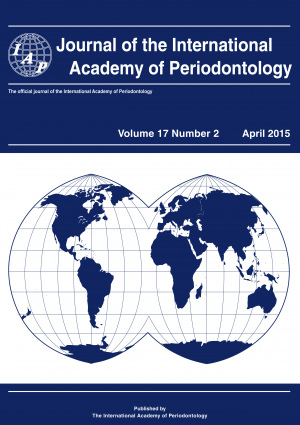 Results: Eight (17%) patients had chronic periodontitis progression. No baseline clinical, radiographic or microbiological variables, and no post-treatment clinical variables demonstrated statistically significant relationships with chronic periodontitis progression. Elevated post-treatment counts of subgingival spirochetes, medium to large-sized motile rods, and crevicular leukocytes, both alone and concurrently, appeared more frequently in patients experiencing chronic periodontitis progression. A post-treatment occurrence of high concurrent counts of subgingival spirochetes and crevicular leukocytes exhibited the strongest association with chronic periodontitis progression (odds ratio = 10.1; 95% CI = 2.2, 45.4; p = 0.004), which was greater than with either morphotype alone. Conclusions: Joint morphotype analysis of subgingival spirochetes and crevicular leukocytes, as simplified biomarkers of pathogenic biofilm infection and host inflammatory responses in periodontal pockets, may be diagnostically useful in assessing risk of progressive disease in treated chronic periodontitis patients.